Free wifi at 10mbs+ which is fast for Orkney. Free Electric Vehicle charger available for guests – there is also a good EV charger network in Orkney. 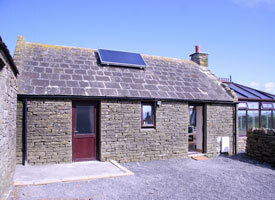 Excellent knowledge of Orkney’s wildlife and 5,000 year old neolithic sites. Organic beef for sale produced on the farm from our small herd of native Shetland cattle (why not take a pack back home for your freezer) – click here to download a beef order pro-forma. (Very!) free-range eggs produced on the farm by our black rock chickens. To check availability on the Peedie House Availability page and then booking enquiry via our Peedie House Booking Enquiry page. We always reply within 2 working days maximum. Note that changeover day is Saturday, and short break availability is unlikely during the main season. With apologies to dog owners we do not permit dogs or pets in the property because of the livestock nearby. The decor in the Peedie House is not suitable for pets. We are however happy to welcome Assistance Dogs. 2019 prices are £400 per week April and October, £450 per week mid May – September inclusive. Access Statement: The Peedie House has been built to conform to wheelchair-access standards, and is a small property all on one level. 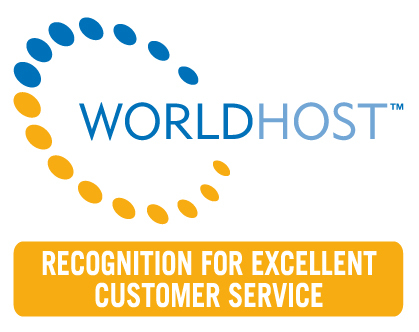 We recognise however that you may have specific needs, and we are happy to try and accommodate these if we can. Assistance Dogs, for example, are welcome to accompany their owners. Please contact us to discuss your specific needs and we’ll see if we can help you. Visitors in the ‘darker’ months of April and October might get lucky and see the ‘Merry Dancers’ or the Northern Lights (Aurora Borealis) – the picture below shows the Peedie House in the foreground (taken 27 February 2014). 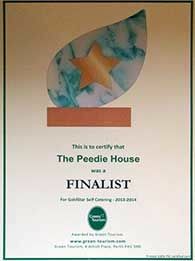 Lots to do and see from 5,000 year old tombs and houses to art galleries and walks, and coming back to the Peedie House! We have had a wonderful holiday in the Peedie House. Thanks for everything. Jim Needle & Vicky Gardner, Oxford.